This page provides you with the latest information on the newest fillers for your consideration. Dr. Abbott has chosen to use only the best products on the market today. He will help you select from five products offered in the Juvederm family of fillers, to find the filler that will deliver the best possible results for you. Volbella and Vollure are the newest products, and are mentioned here. Dr. Abbott and Sonia Sublett-Adams are expert injectors and understand the proper use of these great new products. Latest Review from patient who received her first ever Filler and Botox on June 25, 2018 “Since I became a client of Dr. Abbott I’ve experienced nothing but complete honesty and professionalism. He explains procedures and answered all my questions. Eased my nervousness and made me feel comfortable. The staff is friendly and welcoming each time I visit. I would highly recommend Dr. Abbott!! !” Kristi R.
Dr. Abbott has used Volbella XC extensively since it became available in 2016. He finds it very useful for fine lines and wrinkles around the lips, on the cheeks (the ones that are made worse when you smile), and chin area. Volbella fills these small lines and wrinkles, softening the effects of sun damage and aging. This filler lasts a year in most people who receive it. 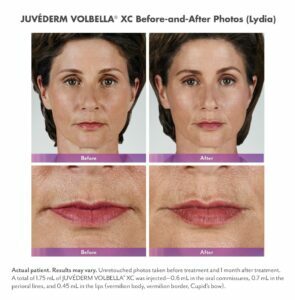 Juvederm Volbella XC is also the perfect product to provide a natural enhancement of the lips for women aged 50-70. Most of these women are looking for a very subtle enhancement that defines and adds a small discrete amount of volume. Volbella XC is a soft clear gel that guarantees a smooth result. You will see the benefit, but others will not likely know what is making you look more youthful and feminine again! Volbella XC also works very nicely to define the border of the lips (vermillion border) or enhance the definition of cupid’s bow (the natural “M” shape in the center of the upper lips). Because Volbella XC is made using Vycross technology, it will last longer than the original Juvederm (Ultra and Ultra Plus). You can plan on receiving up to 12 months of benefit from Volbella, when injected properly by a skilled practitioner. On the day of treatment you will be offered the option of using numbing cream (always in stock at all times). The injections will be completed by Dr. Carter Abbott or Sonia in just a few short minutes, and you will see instant results. On the day of treatment, you will also see some swelling, but this subsides quickly over several hours. Bruising may or may not occur, depending on the patient, and may be seen right away or may show up a few days later. Bruising always goes away, but may last up to two weeks and sometimes longer. Vollure XC is the latest addition to the Juvederm family of fillers, made available to aesthetic providers in 2017. As a leader in the Omaha aesthetic market, Dr. Abbott was one of 5 offices out of over 100 in the area that was given the opportunity to test out this new product. 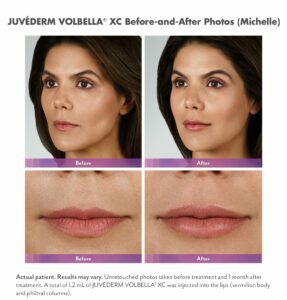 With Vollure XC, we now have five different Juvederm products to choose from. Each one offers uniquely different characteristics. When you visit with Dr. Abbott he will help you decide which filler is right for your needs, and for your budget. Dr. Abbott finds that Juvederm Vollure XC performs very well to improve the appearance of smile lines, parentheses and to provide a lip enhancement that will last longer than any other filler on the market today. Approximately 55% of patients will still see the benefit of Vollure XC at 18 months! That duration of filler benefit makes this filler an instant hit with Doctor Abbott and his patients! It takes only 10 minutes to receive this filler, creating a youthful benefit that will last 12 to 18 months. And you see benefit the same day. First a word about pricing. When you are shopping and searching the internet for where you will go for filler treatment, remember you should not shop on price alone. When you pay for filler treatment you are covering the cost that the doctor has to pay for the product, but most importantly you are also paying for the skill, experience, expertise, reputation and safety record of the doctor who is placing the product. Dr. Abbott will strive to offer you fair pricing, and the deliver the best possible filler results. Let’s also talk about Bundling of services and Promotions. If you decide to have more than one treatment on the same day (such as Botox and one filler or more than one filler at the same visit) then you are bundling treatments, and you will receive preferential pricing. These pricing details will be explained to you by Dr. Abbott or Sonia during your consultation, and before treatment. Promotions may be “Monthly Specials” or “Flash Sales” offered only by email or Facebook. Keep a look out for these deals, as they offer significant savings. Other Promotions are related to Additional Brilliant Distinction coupons that are provided to Dr. Abbott for his use with his patients, and post to your BD account (which is free to create). We will ensure that you hear about the current promotions so you can maximize your savings.